(English translation by Kyeong Park and Eunmi Chang). Hollym, Elizabeth, New Jersey; 2005. ISBN 1-56591-221-7. 6 by 9 inches, 230 pages, softbound. $29.50. This is a fairly nice little introduction to caves from Korea. The majority of the book is an elementary description of cave geology and biology at about, I'd say, a ninth-grade level. 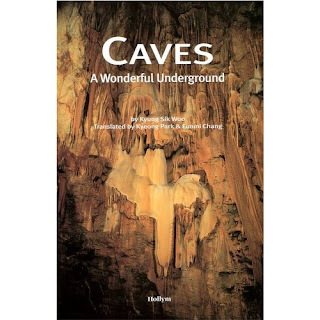 There is more about lava tubes than is usual in such a book, perhaps because they are relatively prominent among the caves of Korea. Except in a forty-page section devoted specifically to the caves of Korea, the coverage is international. There are color photographs on most pages; a number of the photos of lava tubes are by Dave Bunnell. There is a good conservation message at the end, where the author bemoans vandalism in Korea's caves. Unfortunately, there are some of things that are not quite right. The Clansman is not in Carlsbad Cavern. The town and cave in Kentucky are not named Horseshoe Cave. Mammoth Cave was not mined for saltpeter during the Revolutionary War.